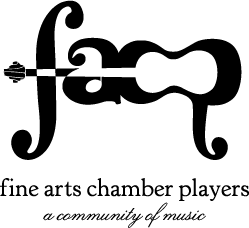 Fine Arts Chamber Players produces two concert series: the Bancroft Family Concert series, and the annual Basically Beethoven Festival. The Bancroft concerts are staged at 3:00 on Saturdays in the Horchow Auditorium at the Dallas Museum of Art. The BFC season runs from October – May, with no concert in December. The Basically Beethoven Festival concerts are at 2:30 on Sundays in July at Moody Performance Hall (formerly Dallas City Performance Hall). Doors for both concert series open 30 minutes before the concert start-time. More information about our performances can be found on the Concert FAQs.